In love with Formula 1: Australian GP: Rosberg took victory in a colourful race! Australian GP: Rosberg took victory in a colourful race! If Red Bull´s Kvyat faced a difficult qualifying yesterday, his race day didn´t turn out much better. The Russian´s RB12 was hit with an electrical failure already on the warm-up lap so his race was over before it even got started. There was a new formation lap before the lights finally went out. Williams´ Bottas had been given a 5-place grid penalty due to a gear box change so the Finn started to the race from P16. What a start it was for the red-suited warriors! Sebastian stormed into the lead from P3 and his teammate Iceman followed him in the first corner as Rosberg tried to prevent Hamilton getting past him. Unbelievable but true, the Ferrari duo had a double lead in the race! This seemed almost too good to be true! Rosberg was third and Verstappen fourth. The Dutchman had taken an impressive start and right from the beginning it seemed that Toro Rosso´s race pace was absolutely convincing. Hamilton had dropped down to P6 due to the first corner incident. Hamilton was able to overtake Williams´ Massa quite easily and make it P5 in the race. But getting stuck behind Toro Rosso´s super talent Max Verstappen turned out to be another story. It was admirable to watch how this young Dutchman kept the reigning world champion behind him lap after lap! Rosberg was the first top driver to pit on lap 13. The German rejoined the track on the yellow-marked soft tyres in P5. Sebastian pitted a couple of laps later and his strategy differed from Rosberg´s tyre choice: Sebastian opted for another set of red-marked super soft tyres. 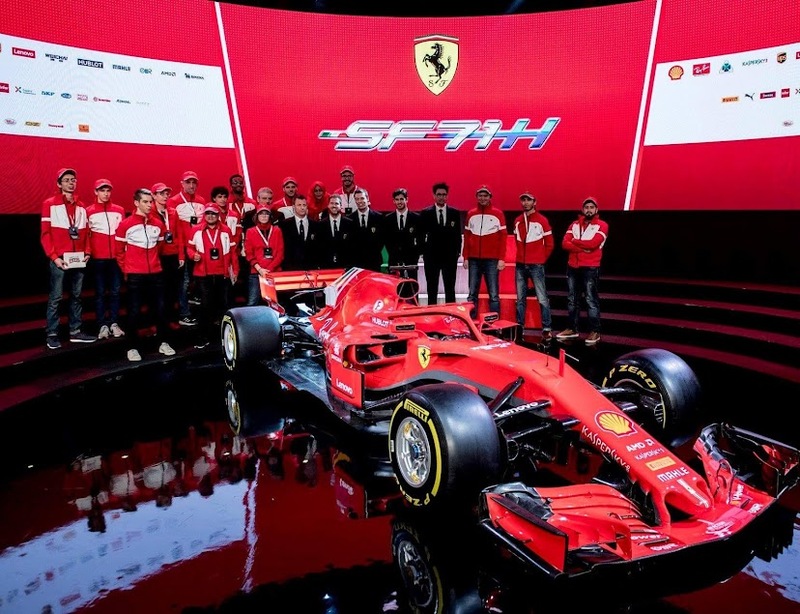 Ferrari´s race pace looked stunning and Sebastian even managed to overtake Hamilton on track before the Briton pitted for a new set of medium tyres, which was a surprise choice. Kimi also pitted on the same lap for a fresh set of super soft tyres. Unfortunately Rosberg managed to benefit from the undercut and got ahead of the Iceman. On lap 18 there was a dramatic collision between Haas´ Gutierrez and McLaren´s Alonso. Alonso hit Gutierrez´s left rear tyre at the braking, which made Gutierrez to spin. Alonso´s car on the other hand first hit the wall and then rolled over several times and ended up on the gravel upside down as a complete wreck! It was a horrific looking accident but against all odds Alonso managed to get out of the car on his own and was unharmed. It´s unbelievable how safe these modern F1 cars are, some years back this could have been a fatal accident! Safety car was deployed and the race was red-flagged due to the massive amount of debris on the track. Some 20 minutes later the re-start took place behind safety car. Both Sebastian and Kimi continued the race on the super soft tyres whilst Rosberg had switched to the white-marked medium tyres before the re-start. Ferrari had chosen an aggressive strategy to attack on the super softs. Ricciardo in his RB12 and both Toro Rosso drivers had opted for soft tyres. Tyre strategy turned out to have a crucial effect on the race results. Only a few laps after the re-start the race got another dramatic turn. Kimi drove into the pits reporting about something gone broken in his car. On TV I saw smoke coming out from the rear of Kimi´s SF16-H and a moment later there were big flames coming out of the engine right above Kimi´s head. What a huge disappointment it was! Kimi´s race had started in such a promising way, the Iceman had the podium in his sight already... Hopefully this was an exceptional reliability issue for Ferrari and that it won´t happen again during this season. I´m so gutted for Kimi, everything looked so good! Verstappen was driving a superb race in P4 until he pitted for the second time on lap 33. The team, however, wasn´t ready for him and the pit stop was delayed. The Dutchman rejoined the track in P11. In the heat of disappointment and frustration we heard very angry Verstappen on the team radio. Sebastian pitted on lap 36 for a fresh set of soft tyres and his pit stop wasn´t perfect, either. The team had difficulties to detach his left front tyre, which cost the German some extra seconds. Sebastian, who had lead the race at the beginning of the race, had to now settle for P4 when rejoining the track. In the midfield Verstappen had an intense battle with his teammate Sainz and Renault´s Palmer for P9. We heard many heated team radio messages from Max, who considered himself quicker than his teammate and was absolutely frustrated to get stuck behind those two. Once again Max´s driving was very entertaining to watch as he has the passion, devotion and skills what Formula 1 needs! It´s utterly great to see how he takes the races with such passion and strong emotions. I like that a lot! Finally after many intense team radio messages both Sainz and Max managed to get past Palmer and the battle continued between the hungry Toro Rosso teammates. A little later Verstappen even touched his teammate in the heat of the battle, which lead to Verstappen´s spin but he didn´t lose any positions. 15 laps before the chequered flag Hamilton managed to overtake Red Bull´s Ricciardo, whose soft tyres were already completely gone and the Briton made it P2. Ricciardo had no choice but to pit for a fresh set of super soft tyres, which meant an aggressive last stint to his race. Rosberg had a clear lead in the race, Hamilton was 2nd and after Ricciardo´s pit stop Sebastian jumped third. Sebastian started an aggressive hunt and managed to close the gap to Hamilton with his fresher tyres. With two laps to go the German was right at Hamilton´s tail but trying hard to find an opportunity for overtaking Sebastian braked too late and went wide, which meant the battle was over. Rosberg won the season-opening Australian GP with Hamilton second and Sebastian third. Ricciardo finished 4th in front of his home crowd, Massa finished 5th for Williams and Grosjean took superb 6th place for the newcomer Haas! This clearly shows that Haas have a lot of potential in their car and they have done excellent preparation work for their debut season in Formula 1. Hulkenberg finished 7th and Bottas 8th. They both tried hard to get past Grosjean´s Haas at the end of the race but it turned out to be mission impossible. The Toro Rosso duo Sainz and Verstappen completed the top ten. I strongly believe Sebastian would have won the race if Ferrari had opted for a different tyre strategy. Although no one would have known how Ferrari would have worked on the medium tyres, which the team didn´t test at all in the free practice sessions. And then there was Sebastian´s own mistake when he was trying to make an overtaking move on Hamilton but even without the mistake overtaking Hamilton would have been extremely difficult. But one thing is for sure: Ferrari have definitely taken the battle to Mercedes´ front door! Already after the first race of the season Mercedes are leading the constructors´ championship with 45 points to Ferrari´s 15. Next round will be Bahrain in a fortnight. After yesterday´s farce in the qualifying the teams have now decided to abandon the new qualifying system and go back to the last year´s one already in Bahrain. Personally I would have preferred a system with running Q1 and Q2 with the new elimination system and Q3 with the old one. Can´t wait what will happen in Bahrain!